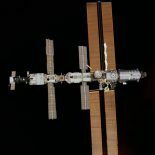 Did you know that the International Space Station is one of the brightest objects in the night sky? And it’s easy to see if you know when, and where to look. At any time there are up to six astronauts on board, each originating from one of fifteen different nations on Earth. Compared to a street map on which we look down on, the maps below show East and West "reversed". This is because the sky map shows what we see looking up to the sky. Imagine you are lying on the ground on a starry night and you are looking vertically up to the sky. Your feet are pointing to the south. West is at your right then and east at your left hand side, exactly like it is displayed on the sky map. You can see when the ISS will be visible on the calendar below. IMPORTANT UPDATE: From Sept 2018 we will only provide the details of evening passes, we will no longer include early morning pass details. Would you like to see the Aurora? Click on this box to find out how we can help! Would you like to see the ISS? Click this box to find out when and where! Click on this box to upload them!